Understandably so, when it comes to KWO (keyword optimization), the SERP that most ASOs are concerned with is that found within the App Store and Play Store, where the vast majority of most app acquisition activity is centered. But because every app has a web URL that leads to its store page, apps also index in SEO results. 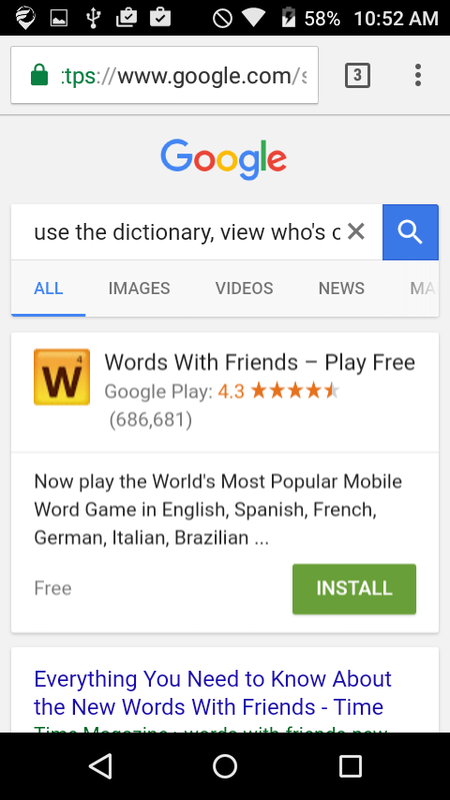 For Android users, Google even allows people to download directly from an app's SEO result. App indexing and SEO have thus far been a topic of curiosity for ASOs given A) the struggle that app indexing has faced (i.e. Apple's Spotlight search flop and Google's more gradual rollout) and B) the unknown results from investing the effort necessary to optimize an app for SEO. That said, the near-future of app indexing is looking brighter than ever given Google's headway in app indexing (not just indexing an entire app, but content within each app as well). For ASOs who are ready to understand the realm of app indexing or for those who are have run out of low hanging fruit, SEO represents an excellent opportunity to grow downloads from outside the App Store and Play Store. While today's article is more of a simple study on the current ranking patterns of app packs (Google's SEO app results), we will follow up with more research soon. A great starting point is this in-depth article written by Emily Grossman, who covered SEO app indexing in-depth a while back. For non-branded searches, the most common opportunity for an app to rank in the SERP was via app pack. Android app packs they contained about 100 (with 6 showing by default). Keywords in an app's title were the most important factor in ranking for both iOS and Android, as was an exact match of the keyword; but neither title keywords nor exact matches were mandatory to earn a spot in an app pack. In iOS, keywords in an app's title, description, IAP (at least sometimes true for exact matches) and user reviews seems to rank apps in SEO. In Android, keywords only seem to produce rank from an app's title and user reviews, with evidence pointing to a strong likelihood that keywords from an app's full description or short description do not produce SEO ranks. SEO app pack results for a keyword search did not mirror the same order of the ASO ranks for a keyword (some apps found in the ASO SERP were missing from the SEO app pack, and the order was not the same). As an interesting side note, the mobile Google Play SERP results did not mirror the web Google Play SERP (in one search the difference was just 1 rank spot, but in a second, the magnitude of the change was 5 spots, which represented a mobile ranking that was 50% better than the web ranking). While 17.8% of searches included the word "app," these searches only made up 3.6% of the monthly search volume. Adwords ads appeared with preferential positioning (located first, above app packs if both showed) and a large listing for many searches that did not return app packs. These keywords (e.g. "online" terms) make good targets for an Adwords PPC campaign. Beyond the ad text, icon and download button, app install ads included the star rating and total number of reviews, along with automated callout extensions. Todoist - single result for Todoist. To do list – app pack with 30 app results. All but two apps listed to do list in their titles. One of these outliers (Remeber the milk) did not include any of the words of to do list keywords in its title, but listed three instances of "to-do" in its description. Most apps included an exact match for to do list, though a handful did not. 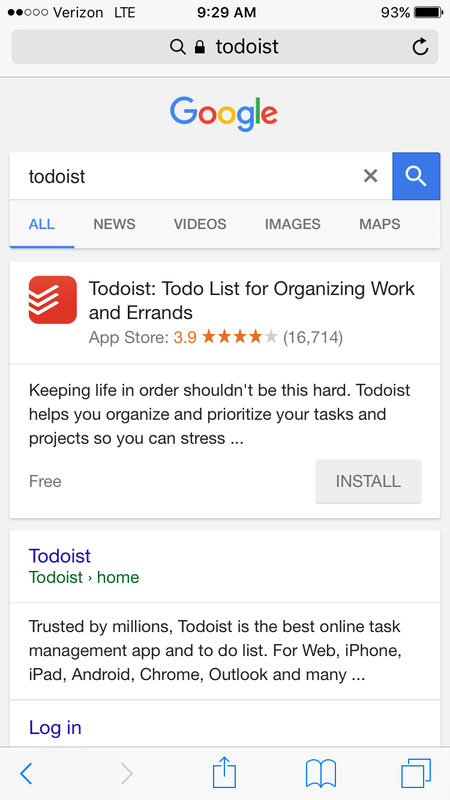 Tasks – app pack, under the Google definition of "tasks." Most apps had "tasks" in their title. Sir Jobton (the name of one of our app, Goalie's IAPs) – single result for Goalie. Bizeebee (the name of another of Goalie's IAPs) – no app results. Listor (the name of another of Goalie's IAPs) – no app results. Allow subcategories and sharing the (taken from one of Goalie's recent reviews) – single result for Goalie. Remind your better half to buy milk (taken from part of Todoist's description) – single result for Todoist. Many searches with app appended to the end of return app packs, but not always. Most had an exact title match for to do list. A few (e.g. Evernote, Remember the Milk, Google Keep) did not include any of the words of to do list keywords in their titles; Evernote and RTM included to-do in their full description, but Google Keep did not. 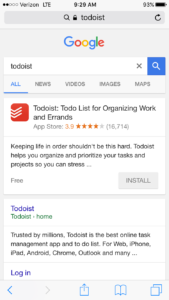 To do – app pack, mostly similar to an iOS search for to do list (but included a higher concentration of to do list apps); most results had a title match for to do. 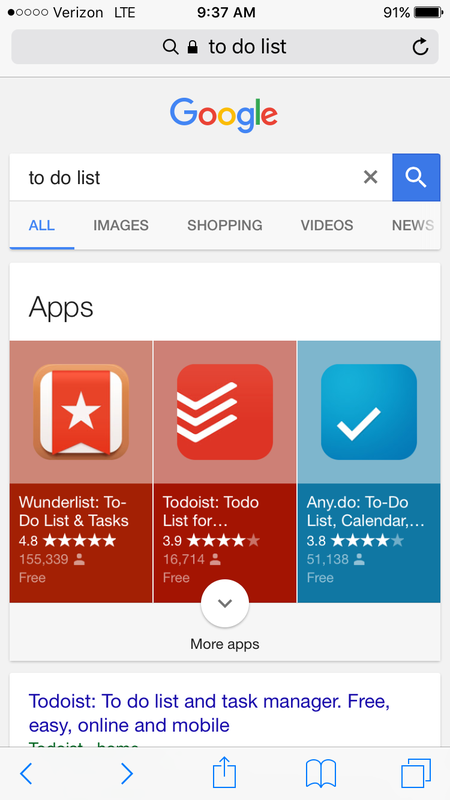 Tasks – app pack, also located under the Google definition of "tasks." 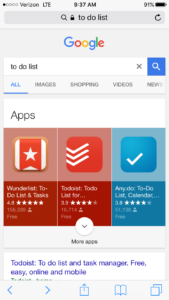 Similar results to the iOS search and few apps were present without tasks/task in their titles. The beautifully simple to-do list and task manager built for the pace of modern life (taken from part of Todoist's description) – no app results (though a Chrome webstore result, Mozilla add-on and Microsoft store result did show). Your beautifully simple to-do list for work, home, and everywhere in between (Todoist's short description) – app pack (though Todoist was conspicuously listed #8). Your beautiful and simple to-do list (Wunderlist's short description) – app pack (though Todoist was listed #4). Messenger — a faster way to message. (Facebook Messenger's short description) – no app results. Messenger – app pack (Facebook messenger is #1). Use the dictionary, view who's online, then it would be (taken from a user review of Words With Friends) – returned single result for Words With Friends. This is not the final version! We're huge fans of constantly updating and tweaking things (taken from Skyscanner's developer reply to a user review) – no app results. Easily search flights, hotels and cars all in one place (taken from Skyscanner's description) – no app results. Flights, hotels and cars - no app results. Flights, hotels and cars app – no app results. Flights app – app pack with Skyscanner in position #2. Many searches with "app" appended to the end of return app packs, but not always. What influences app ranking order in an app pack? Do apps that are downloaded more rank better than less popular apps? Do apps with and Android version rank better? 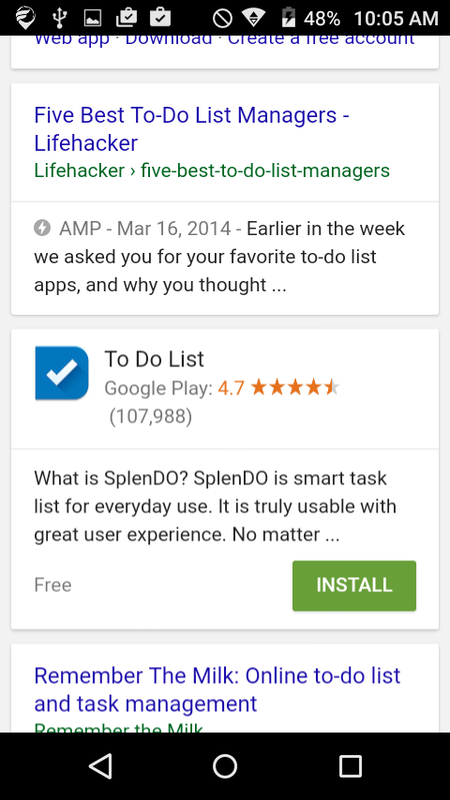 When does Google decide to show an app pack? 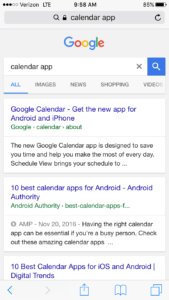 Does Google require a certain number of apps that must be eligible to rank? 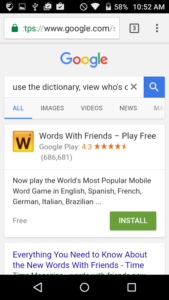 When does Google show a single result vs an app pack? How much impact does the iOS description hold on ranking? Will iOS developer replies rank for keywords?